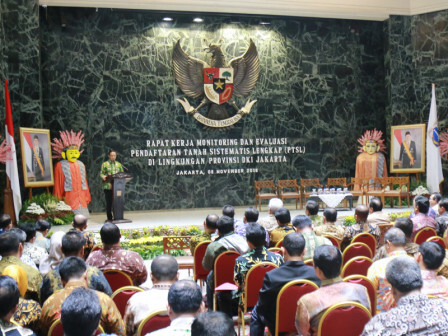 Jakarta Provincial Government fully supports Complete Systematic Land Registration (PTSL) program runs by Agrarian Affairs and Land Spatial Ministry/National Land Agency (ATR/BPN).
" This innovative program gives a positive impact to residents"
Jakarta Governor, Anies Baswedan said, Jakarta Government allocates Rp 120 billion in budget year 2018 and allocates Rp 64 billion in budget year 2019 to facilitate land certification process for 525,655 lands in Jakarta. "This innovative program gives a positive impact to residents. It could enlighten their life through a clear land status," he expressed while conducting PTSL Monitoring and Evaluation Work Meeting at City Hall, Thursday (11/8). He explains, land ownership legality becomes the most basic matter and Jakarta is ready to be the first that applies ATR/BPN Ministry's innovations and development. Thus his side wants regional heads to support PTSL program and have an intensive coordination with BPN regional office thus they can realize target to certify 525,655 lands. "If it can be applied well in Jakarta, then other regions can also apply it well. All of it is done to ensure an equality for all Indonesian people," he asserted. Meanwhile, ATR Minister or BPN Head, Sofyan A. Djalil stated, government wants to register all land plots in Indonesia with priority in urgent areas, especially big cities. After all lands are registered, certificates can be issued. Then all land disputes can be solved, lacks of documents can be announced, and it can prevent another land dispute in the future. "We can know easily about ownership information, location, land size, and its NJOP or PBB. Thanks to Governor and its subordinates, we hope our target can be achieved," he stated.